I hadn't intended to attend MFF. Indeed, I originally just asked a few of our contributors to consider mentioning WikiFur to others at the con. Duncan da Husky was quick to point out that he was in a good position to be able to print out a few hundred leaflets to help promote WikiFur . . . if I could get the design to him the next day. It didn't take all that long to put something together, and while I was doing so, the thought crossed my mind that they might well be more effective if they were actually handed out personally rather than left on a table to be looked at and forgotten. Of course, by then it was Tuesday, and the con hotel was fully-booked for Friday. Fortunately the resourceful Duncan had some advice for me - the Amerisuites across the parking lot still had plenty of rooms free. I checked, and not only did they have rooms, they were cheaper - only $81 for the best available rate, including breakfast and wireless! I figured this was more than worth the extra walk. In fact, I ended up not needing the wireless, but you'll have to read on for why. The flight over from Detroit went smoothly enough, despite a short delay and nearly losing one vital sheet of paper with the transport reservation numbers on it. Soon I was on my way to the Hyatt! Of course, I arrived too early to actually check into my hotel, so I ended up lugging my luggage around for the next six hours or so. Ahh, well, next year I'll book earlier - or perhaps fly over the night before. Getting out of the limo, I was immediately greeted with a group of furs with tails standing outside the hotel. Any further uncertainty about being in the right place was quashed when I entered the lobby . 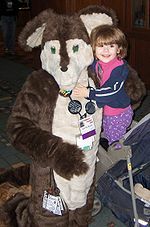 . . only to be approached by a raccoon perched on a human's shoulder, who proceeded to direct me to the registration area. Wandering past numerous fursuited individuals, I headed down to the registration desk to meet Duncan and pick up my badge and sponsor kit. I wandered around for a few minutes, getting my bearings, then headed off to the opening ceremonies. I don't remember much of the ceremony - It was pretty much just "welcome, please don't mess up the hotel and we'll all have a great time - oh, and if you see any representatives of the media, tell us so we can shoot 'em". The guests of honour (Gene Breshears, Kenket and Tincrash) were in attendance, along with Uncle Kage, 2, and of course our convention host, Takaza J. Wolf. The final act - a question and answer session ("Where do people go to prepare for the variety show? - "People prepare for that?") 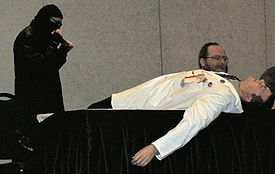 - happened to include the Death of Kage, followed swiftly by that of all the other panelists. Fortunately, they recovered somewhat for the next hour, which was occupied with a question and answer session specifically for the guests. Remember fans, always drink responsibly! One of Gene's first questions to his parents: "Where do books come from?" Gene: "You have to crank it out or you never finish . . . if you start polishing before you get to the end, you don't get to the end"
Tincrash: "'Do you crank it out or do you polish' - that question's a little personal, isn't it?" Tincrash: "Collecting pie? No. Pie is something to be enjoyed - shared with the world . . ."
"What drew you to anthro characters?" 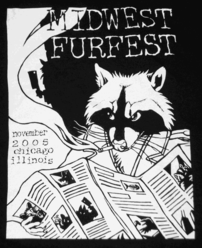 Tincrash: "I would just draw this stuff - I kept getting it referred to as like ninja turtles, and I said 'no, this is a dog'"
Kenket: "I've been drawing them my entire life - only stumbled across [furry] by roleplaying on a MUCK which I didn't know was furry at the time. I would love it if I could make children like animals by drawing animals and infiltrating their minds and making them furries." Gene: Thornton W Burgess. Stuffed animals. Burgess books like Little Joe Otter, talking animals, not very anthropomorphised . . .
Tincrash: "Do I like to draw in pie?? Well, it's not easy - more of a fingerpaint, random spontaneous bursts of energy, pie . 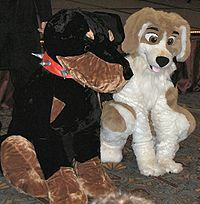 . ."
After the GoH Q&A I had an hour to use before the next big event, so I decided to attend the panel on puppet construction, which I had been interested in ever since I found the Funday Pawpet Show. 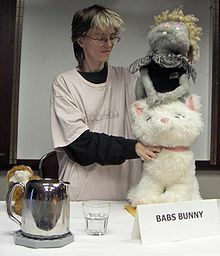 The panel was indeed interesting, hosted as it was by Babs Bunny and by her lapine friend, Timothy Rabbit. I learnt much, although I don't intend to be making my own anytime soon. The next item on the agenda was "So, it's your first furry con?" 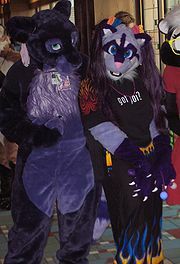 - an hour of useful advice on the ins and outs of furry conventions. Memorable demonstrations included how not to greet a fursuiter and how best to block an dealer's table. Also mentioned was the 6-2-1 rule for conventions - six hours of sleep, two meals, and one shower! Unfortunately, I had to miss the Furry Futures session because I needed to check in - and grab one of those showers. After that I got a good seat for Uncle Kage's Story Hour, which proved to be somewhat grisly, yet oddly mesmerizing - and yes, hilariously funny at times, too. After a musical interlude, the stories gradually merged into a show by 2 the Ranting Gryphon over the subsequent hour. 2 was planning on doing a DVD, as well as a submission for a general comedy track, and I think perhaps some of that leaked into the content, which seemed oddly generic at times - he got a lot more laughs when he got into the more furry-specific stuff, although the tale of his LSD experience brought plenty as well, apparently just like last year. I'm not sure how that DVD's going to go, considering we spent half the time applauding his backside (you kinda had to be there :-), but hey, at least he was willing to stand in front of a crowd for an hour and try to make people laugh. By the end of the show, my stomach was growling. I decided to brave the cold winds outside and go in search of something to fill it. As it turned out, I didn't have to go far - there was a nice italian place across the road, though I did spend four minutes trying to cross said road, and another twenty waiting for a table. Food arrived quickly, though, and it was certainly filling enough. A half-hour later I stumbled back into the con, taking a short detour via the (green!) labyrinth to the variety show. The quality of the acts was . . . well, varied, but good overall. I especially liked the Macavity song (had to stop myself singing along), and Velveteen - the story of the plush toy who lost his owner's love to another - was very moving. 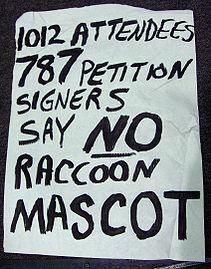 We also got to see Jugular Jaguar (who had been collecting signatures for the anti-raccoon petition) get what was coming to him. It ended up lasting almost beyond 2AM, and I stayed up a bit longer chatting with a few members of the audience before it was time for bed. Looking back at everything that had already happened, I wondered how Saturday could possibly top that. I was about to find out! I got up . . . not entirely early . . . grabbed some fruit, and headed out to the most interesting thing I found that early on in the schedule - the greymuzzle "and what did you do last weekend?" discussion group. I only caught the last half of this, but it was definitely interesting to get some other perspectives on how to talk about the fandom. After the panel I had a half-hour chat with Innerwolf and StalkingCat about WikiFur, MFF, and the changes in the fandom over the last few years before going back down to the convention. The sponsor's brunch was well attended - in all, around 85 red-ribboners showed up and proceeded to eat the Hyatt out of house and home, including Xydexx (who I met at the buffet) and our guests of honour. I particularly enjoyed the custom omelets! I did also succumb to the temptation of the rich chocolate cake, only to find that one slice was more than enough. I swear, they make those things out of solid flour! . . . well, and cocao powder, of course. I dropped by the Dealers Den to take a look around and pick up my sponsor t-shirt, which was pretty neat - I ended up wearing it later that night. As they'd previously announced, upgrades to polo and denim handstitched versions were available. The denim shirt did look good, but I've never really liked wearing denim - and besides, $20 extra is $20 extra. I then stepped into the Artists Alley in search of a con badge. What I actually ended up getting was a sculpture of my character by Tailchaser Sushi (fireEyes); at least, I did after a detour to get a printout of my character - thanks again, Duncan! I got back for the fursuit parade, which was incredibly long - I later heard there was around 150 fursuiters involved. It took almost ten minutes for them to go one way, and then they came marching right back the other way. Great stuff. There was one bird with a sharper beak than 2! After that I had a couple of hours to kill, so I dropped into the pencilling session, and then attended the TransFurs panel before going off to catch the end of the charity auction. Certain questionable tactics were put to devastating use in order to elicit the princely sum of $600 for an evening with 2 and Kage - not bad for an hourly rate! 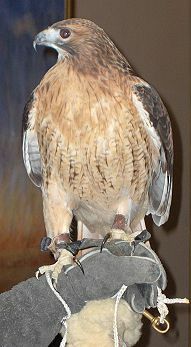 The entire auction raised over $3,000 for the convention's charity, Wildlife In Need. Speaking of which, I got a great photo of some of that wildlife! Alas, I soon found my second battery had swiftly run out. Catching the fursuit parade in movie form had evidently drained it to its last ergs, and it only managed to catch a shot or two of the fursuit games before conking out entirely. I ended up returning to dump the camera off back at my room - all things considered, this turned out to be an exceedingly good plan. So, the disco. The first two hours were the "fursuit-friendly" dances hosted by DJ Butterscotch Vixen, and in all honesty, these were the best two hours of the convention for me. It was more than a little surreal dancing with a whole bunch of people in fursuits, but at the same time it was great to actually be doing it. Later the lights got dimmer, the music got heavier and . . . well, put it this way: A whole day later, my legs are still hurting. No doubt some of the people there were wondering who the crazy guy in the MFF t-shirt with the balloon in one hand and the glowstick in the other was. Now you know! Our dancing was cut short by the threat of fire, and we were instructed to make our way calmly towards the exits. By this time, of course, it was pretty much at the freezing point outdoors. Chilly, but I'm sure the remaining fursuiters appreciated it! After the fun and games of the (inaudible) fire alarms, I returned to the disco floor for another half-hour or so, but by that time I was wearing out the adrenaline rush. Eventually, enough was enough, and I decided to head for the last event for the night, where I had heard that a show about some person named "Rocky Horror" was being performed. Well. It was. A very curious experience it was, too. Our host (Socks) subsequently decided to show a few of the movie shorts that he couldn't show at the "Weird Stuff on the Net" session on Friday afternoon. This ended up being around two hours, including a ten-minute section on base-jumping, and finishing up with some amusing cat footage. I then made my very weary way to bed. After all the excitement of Saturday, I was rather glad to find that Sunday had a less packed schedule. 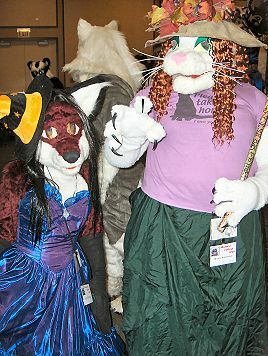 I had intended to attend the Midwest Furry Fandom board meeting at 9, but - somehow - this didn't quite happen. Instead, I ended up checking out and getting in around 10:30, which was time for a bit of browsing in the Artist's Alley and to pick up my sculpted badge before heading off to the (non-charity) Art Auction. 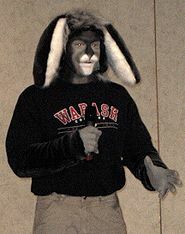 After the art auction, I attended the "For when a fursuit is more than costume" panel. I didn't exactly relate, not having a fursuit and all, but I could at least understand the fursuit maker who talked about the effect his work had on his clients. Soon I was ready for the last item on my schedule - the puppet show (and songs), hosted again by Babs Bunny, with help from many other puppeteers. All good fun, and some of the songs were a blast. I thought this would be the end of my adventures, but it was not to be. A few minutes later, I was joined by none other than the esteemed Dr Conway himself. It seemed that both he and I had flights to catch at O'Hare, and were both using the My Limousine service to get there; indeed, we ended up sharing the same car! Funnily enough, one minute before our ride arrived, another of their vehicles - a stretch limousine, no less - turned up to pick up another fur. We were relegated to the 4-person town car. Not the most efficient of arrangements, but I'm sure it made sense at the routing office. 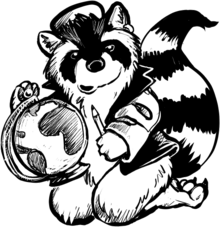 I'm sure the question on all the wikifurries' minds (at least, those who have bothered to read that far, or the clever ones who just clicked the heading to skip ahead) is "so what about WikiFur?" Well, you can be sure that I was not idle! Considering how many leaflets there were (thanks again to Duncan for tweaking the layout and printing them out), and how easy it might be for people to pass them by on the freebie table, I figured it was a good idea to acquire a few batches and distribute them over the course of the convention. I also found it was a great excuse to start taking to people! 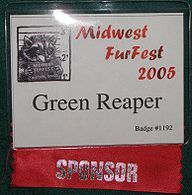 My first conbadge - but, thanks to MFF, not the last! And the response? Mostly "hey, that's a neat idea . . ." or "yeah, I checked that out once, I'll go back and see how it's going", with a few "don't you recognize me? I'm one of the biggest contributors!" (sorry, Wesha, Lurdanjo, et. al. - I was trying not to stare at people's badges before offering, and I didn't know what any of you looked like! ;-). Overall, people were very positive about it. I did meet up with a few people who disliked WikiFur, most often because they'd found an article about them and were amazed that anyone had dared to write about them without consulting them first, but these were very definitely in the minority. And that's the end of my con report! Whew. Here's looking forward to next year!